Century Trailers present you with outstanding quality designed Flat top trailers for Australian rough conditions. Century Trailers build 4 different ranges Flat top trailers to meet all different propose. We offer 3 different finance company (Zip money, Trailer pay, Credit one) on our entire range of trailers where cover 0 Interest free finance , Low docs finance, and Normal finance. A flat top trailer is a type of trailers, which are fully flat and opened at all four sides to facilitate the transportation of longer or wider materials. Due to the all opened sides, the loading and unloading of materials would be easy and convenient. We are a well know organization in the industry for catering a wide range of Flat Top Trailers of several sizes as per the requirements of the clients. 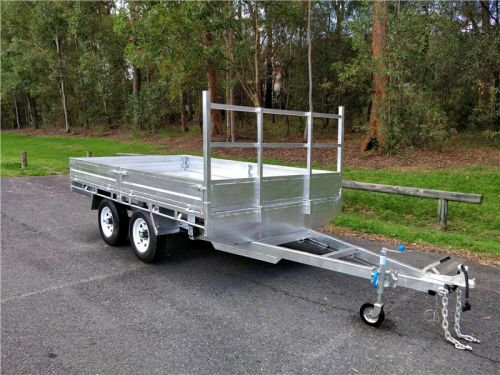 Century Trailer manufacture bring many types of trailer including Single / Tandem Axle box trailers, boat trailers, hydraulic tipper trailers, Flat top trailers, cattle trailers, builders / tradesman trailers and fully enclosed trailers. We take pride in the strength, Safety and quality of every Century built for Australian conditions. Century Trailers’ reputation for combining quality and value for money ensures satisfaction, enjoyment and even great resale value. With Century Trailer, all you have to think about is what you want to do.